Matches my previous working set PR. Last time I hit 210 I stalled. Failed to make 5x5 on Sunday, but made it today. Only made 4 at 305 on Sunday. No training partner today, but I think he would have said rep 5 was a bit wobbly, it felt that way. Anyway next week I go to madcow which begins with a deload from my max set, so it should all take care of itself. This was my 2nd stall point and I knew walking in I was going to breeze through them. They were almost boring. Awesome. Re-read Rippetoe's SS on Bench and realizing I was lifting my shoulders up, creating a longer bar path. Today the mental effort was keeping shoulders down while pressing up and it felt totally different. Had an "a-ha!" moment as I felt how perfect it was to keep the shoulder blades pinched together while doing this. This was supposed to be 8, but I plain forgot. These continue to mystify me, I'm at a hard stall here. Going to tape myself and ask for some advice on this one. Last edited by KenDowns on Tue Jul 19, 2011 8:05 pm, edited 2 times in total. Madcow week 1, day 2 "Light Day"
These were a killer by rep #7. Eight reps is a different animal from 5 reps.
Have not really thought about weight, but next time will try to match the bottom set of the regular deads, and try to improve from there. Have decided to keep these on Day 2 with deficit deads, and will go up to 5 sets. My daughter is the athlete in the family at 12. She came down to work out today, first time. Have been practicing Rippetoe's suggestion to lie on belly and lift legs to establish kinesthetic sense of lower back. Think I may never have been tightening my lower back on squats. Tried today and it felt quite different, and did not get that weird lower back stiffness after the sets today. Rest Day. Traveling and letting my lower back recover a bit. Madcow week 2, day 2 "Light Day"
My training partner taped me. Turns out my upper back was too low and rounded, these became easier when I watched the tape and he gave me some cues. Madcow week 3, day 2 "Light Day"
Very humbling. My training buddy is becoming more of a real training partner and is learning to correct my form on deadlift. Turns out I was doing the "lift your hips before the bar moves" thing, failing to push off with my quads. Once he got me straight and doing it properly the 255# became *much* more difficult, and I could do only 4. And my traps and quads were sore the entire next day. So I guess it's a good thing. Am trying to use the lowest working set for these. After my newly ruthless training partner corrected my form these became deadly, especially after burning out on the working sets. * A collapse of discipline in the Downs gym. Instead of doing the backoff set of 8x155 I wanted to see if I could hit the 3 reps I would hit on a 5/3/1. My training buddy is becoming a true training partner and has learned to spot my form on these. After making some corrections on my back position this became much easier (unlike deads which became much harder). Felt like I had plenty more in the tank but vision was getting blurry on #7 and I was afraid of blacking out and dropping the bar. Knew I had at least one more, but wasn't sure I had two, so I stopped to leave one in the tank. Taped these and will be posting them in General on my thread about Deadlift form. Strange note: after watching my tape at 220 realized my shoulder blades were too far back, focused on moving them forward and 245 felt amazingly smooth and easy. Was supposed to be 3x10, so I have to add more resistance tubes when I get back from vacation. 260 - 1 * NEW PR by 10 lbs. Normally today would be a deload day but since I'm off next week I wanted to see if the program boosted my squat. 215.0 - 1 * NEW PR by 5 lbs. This is very significant because I failed 215 last week. I deliberately tried last week before starting the new 5/3/1 to see if the new program would boost my 1RM, which it did. Nice! 1.5x body weight here I come! Was extremely upset when I could barely pull 3x120, not knowing I was pulling 130. Today's Tagline: so, if 5+ means at least five, and I do only 5, it still counts, right? Kids did 3x5 negatives on chins, and 2x5 with resistance bands. 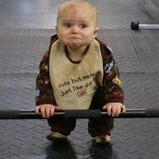 Used Starting Strength method to find first workout weight for kids on squat and bench. Then they lost interest, did not get their weights for rows.